Jennifer Alfano and Miss Lucy swept the first day of the High Performance Hunters at the Buffalo International Horse Show. Photo by: Kendall Bierer/PMG. 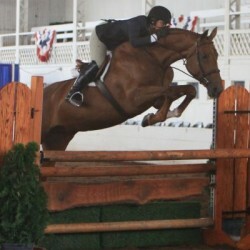 Buffalo, NY – September 12, 2012 – The Indoor Arena was filled with hunter excitement as the first day of the Buffalo International Horse Show (BIHS) commenced at the Buffalo Equestrian Center.